A dedicated WJCU app is now available on a new mobile platform: the iPhone! iOS users now have an even easier way to listen live to our FM and WJCU-2 web streams in crystal clear digital AAC audio, as well as check WJCU news and other station info. Please visit our WJCU for iOS for more information about the app, or head straight over to our page on the iOS app store to download our new app for free! 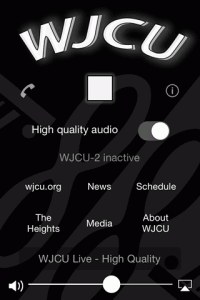 As a reminder for Android users, we already have a WJCU for Android app available as well! As this is our first release for the iPhone, please let us know if you encounter any problems—streaming or otherwise—as well as any ideas for improvement. We’re committed to making everything work perfectly, and that can be difficult with a first release. Please report any issues you run into to apps (Email: apps -*AT*- wjcu.org ) and we’ll get right to work! If you love the app, please consider giving us a 5-star review in the store!